Grey Wolf and Iron Lady are enjoying the bustling Chilean metropolis of Puerto Williams. They are preparing for the FPB ARC: Antarctic Cruising Rally. 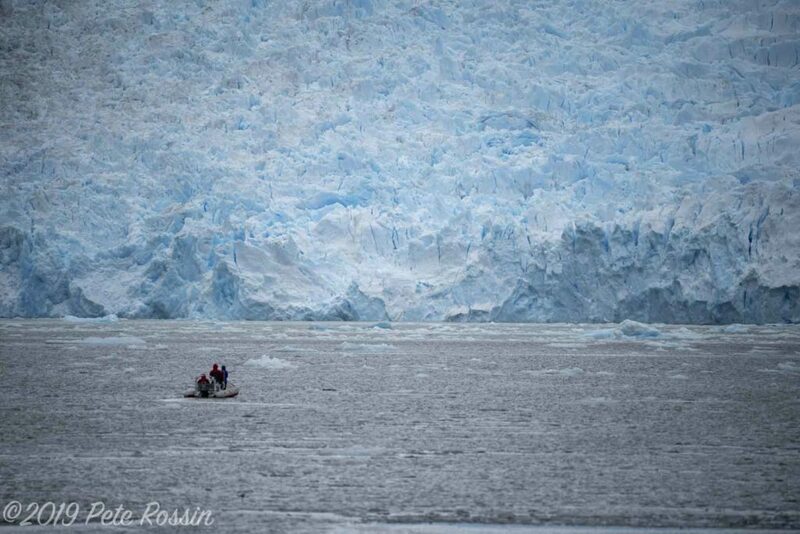 Chilean fjords are but a prelude to what is expected after the short hop across the Drake Channel. Grey Wolf has had a watermaker issue, so she is filling up here at the local glacier face. 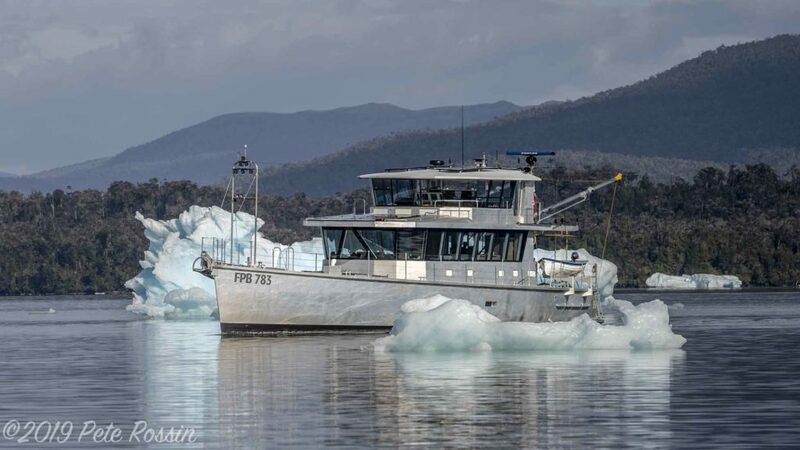 She carries 2,000 gallons/7,500 liters of fresh water, so the glacier-filling process takes a while. Both boats have a drone aboard. This and the lead photo are samples of what we may be seeing more of in the future. 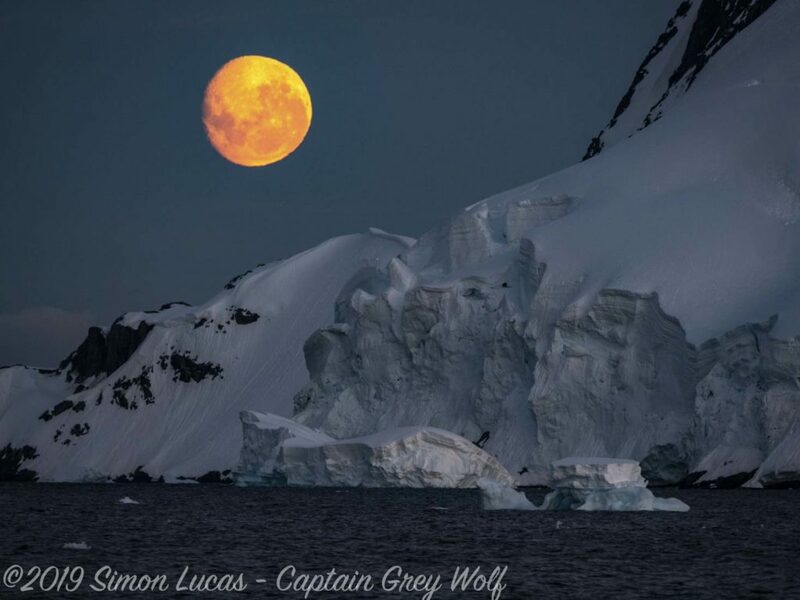 The Antarctic peninsula being only a short hop south, Grey Wolf has been down already to have a look. The following photos give us a sense of the area. 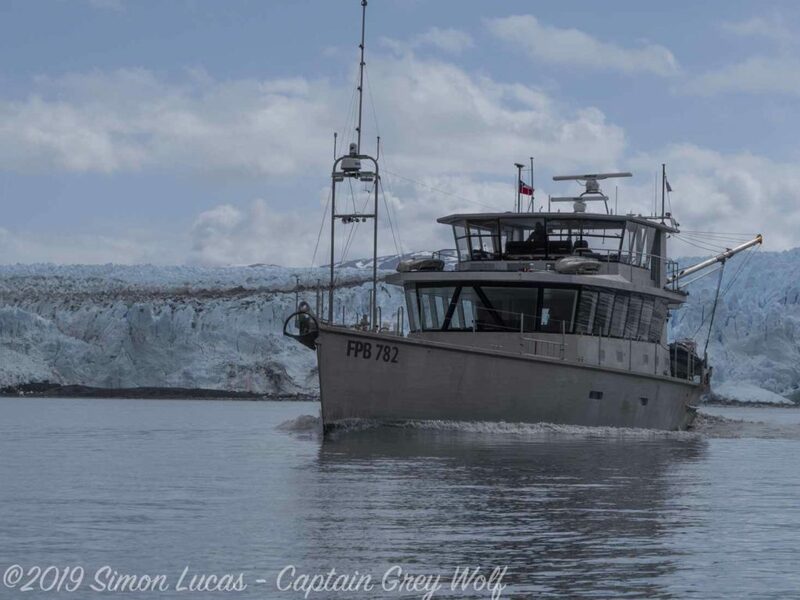 FPB 78-2 Grey Wolf is available for charter. For more info click here. Weather window to the Peninsula opened earlier then forecast so we scrapped the plan to visit the Horn for now. Plan was to leave late Sunday and stop at Isla Herschel (at the Horn) overnite and strike off Monday but weather now favors leaving midday today and striking off directly to the Peninsula. As such, yesterday was the usual mad rush to finish last minute preparations including provisioning, dinghy fuel, last minute maintenance, preparing passage food and clearing out. 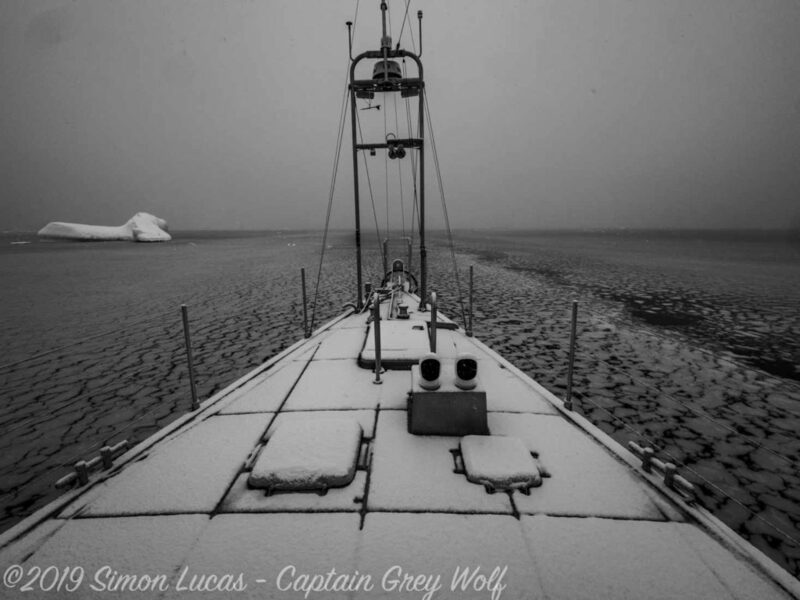 Intend to pull the hook around noon and we, and Grey Wolf, will be off the bottom of the world. Transit time to the top of the Peninsula will be about 2.5 days. Weather looks to be 15 to 25 knots of wind from the north behind us which is ideal. It doesn’t get much better down here – every day seems to blow 20 to 35 knots at some time. Waves forecast to be from the west around 3 to 3.5 meters with a period of 10 seconds easing as the passage progresses. Leaving directly has the added benefit of a more easterly route south which gets us out of the notorious shallows that generate the monster waves around the Horn as the southern ocean swells encounter the shallows. Hopefully we will have clear skies for the Wolf Super Blood moon tomorrow night. Will try to do brief daily updates via our sailmail account. Best from the good ship and crews of Iron Lady and Grey Wolf. 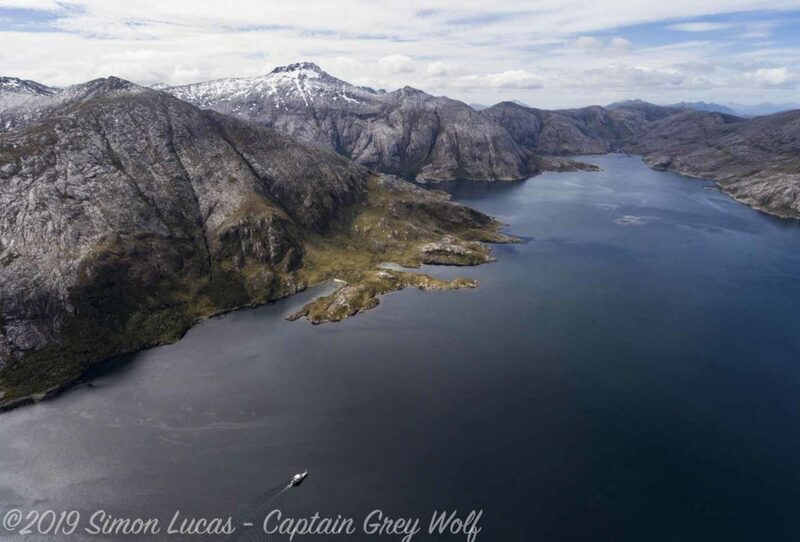 Greetings from Iron Lady and Grey Wolf cruising side by side at 57 degrees 30 South – some 117 nautical miles SSE of Cape Horn. Forecast is holding – we had crossing swells from the NW and SW overnight, 9 second period. A bit confused as when they reinforced each other, the peaks topped out at 4 to 5 meters. Northerly winds 25 and easing. Sea state this AM down to a 3 meter long swell and light northerly chop. Air temp 2 C.
Took the inside passage between Isla Navarino and Isla Lennox last night to pass close by Cape Horn but it grew dark around midnight and we could only see the lights. 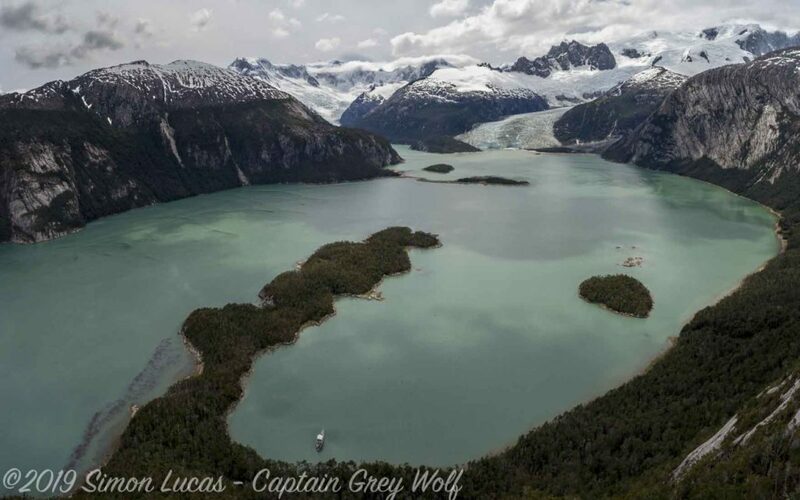 Did manage to get a picture of Grey Wolf steaming thru the passage with Cape Horn in the background. They got some of Iron Lady against a beautiful sunset. We did get a brief clearing and I managed to get a picture of the Wolf supermoon but, unfortunately, the eclipse was obscured by high clouds. We had roughly 2 hours of darkness last night. It was light again when I went on watch at 0400 but the sun did not rise above the horizon until 0500. Suspect even less tonight but is is light well before the sun rises as it is just below the horizon. To be expected given how far south we are. Greetings from Grey Wolf and Iron Lady. We are cruising in dense fog about 1.5 NM apart. Present location is 60 degrees 37 minutes South – roughly 165 NM from the Antarctic Peninsula. Weather has been pretty much as forecast. Last night, we passed thru a weak frontal zone and winds dropped to light and variable. Seas are slight with a gentle long swell. Visibilities have varied but have generally been around 50 meters in fog. Barometer has been falling and seems to have bottomed out at 980 mb. Air and sea temp are now down to around 1 C.
There was a brief period of darkness that lasted around 2 hours last night. At current speed we will make the pass south of King George Island around 0100 local on January 23rd. We may then need to hold station until first light to get into the Frei Station anchorage. We passed our first iceberg last night. Sun is attempting to break thru the fog now so maybe we will see the next one visually other then on radar. The crew were playing the game Battleship over the VHF yesterday – pleased to report we sunk Grey Wolf with only minimal damage. After a difficult approach (for me) with inaccurate charts, ice bits and building seas with an approaching system, we are now anchor down in Yankee Bay at 0315 local. Blowing up to 35 knots on the way in. Running on adrenaline. Fantastic sunrise silhouetting the glacier and penguin colonies in the bay, so had to throw the dinks in to experience the moment. Toasted the occasion aboard Grey Wolf with Shackleton reproduction scotch. Cannot begin to describe the rush of navigating these difficult waters in our own boat with challenging navigation, and the stark beauty of being here. Off to bed now. More to come. Made Antarctica landfall around 2115 local on January 23. Entry into the Nelson Strait at around midnight. Had 3 to 4 knots of current against us with following seas that built into large standing waves as the water shoaled. Those of you who have been in tight quarters in inlets with opposing wind and tide know how challenging this can be. Most of the charts here are inaccurate. While they accurately depict the size, shape and relationship between land masses; they are not generally accurate in terms of latitude and longitude. This necessitates using parallel index lines on our radar using prominent land features to establish course and safe distances from land masses based on charted water depths. In the case of Nelson, there was very little margin for error. Once thru Nelson, we proceeded south down the Bransfield Strait to Yankee Harbor. Winds were blowing up to 35 knots with ice bits around so navigation in the wee hours of the morning in almost total darkness was a three person affair, with two lookouts using visual and radar and a helmsman. We made turn into Yankee Harbor and dropped anchor around 0315 local. 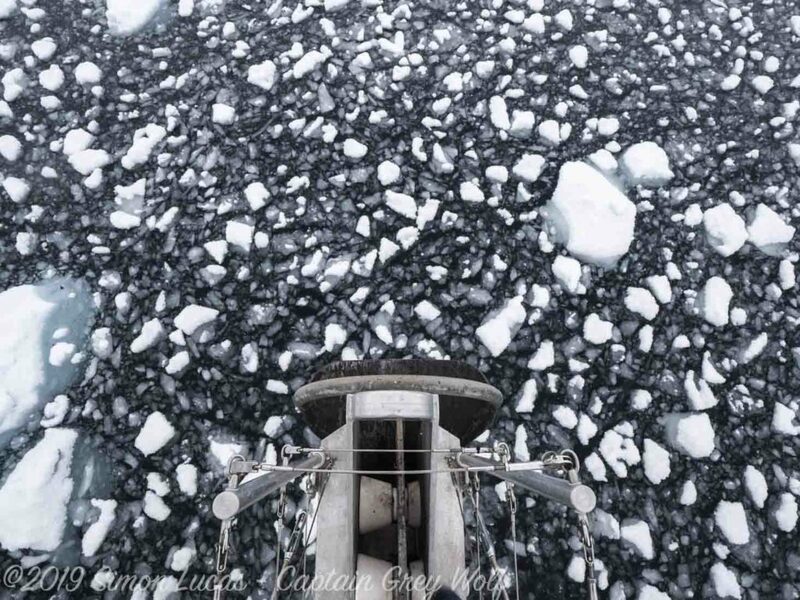 While everyone aboard both boats were tired, but the thrill of being at anchor in Antarctica was too much. We put the dinks in the water. Sunrise was spectacular with wonderful shades of purple and pink. Aboard Grey Wolf, we all toasted our safe arrival with Shackleton reproduction scotch. A fitting choice. 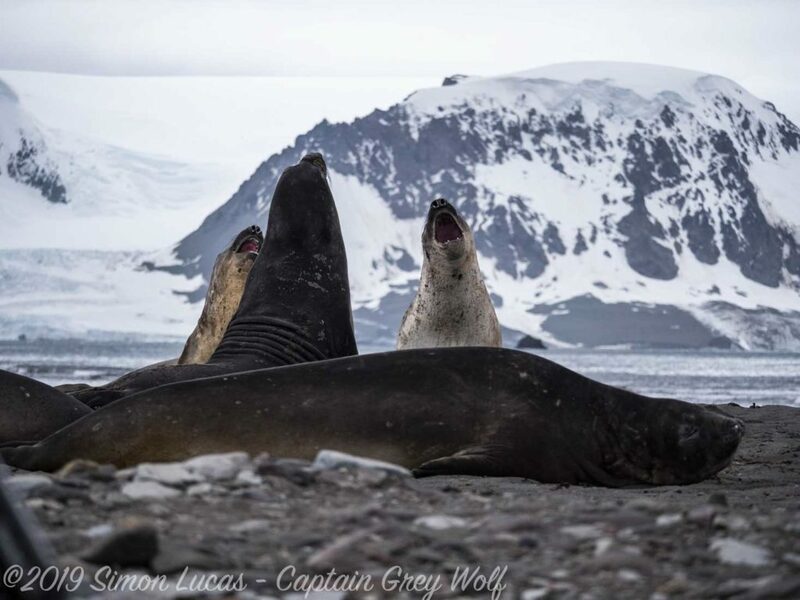 After a bit of rest, we were all aboard Grey Wolf for brunch and a briefing on Yankee Harbor, the rules for observing wildlife, protected areas and boot cleaning to insure no contamination was brought ashore. 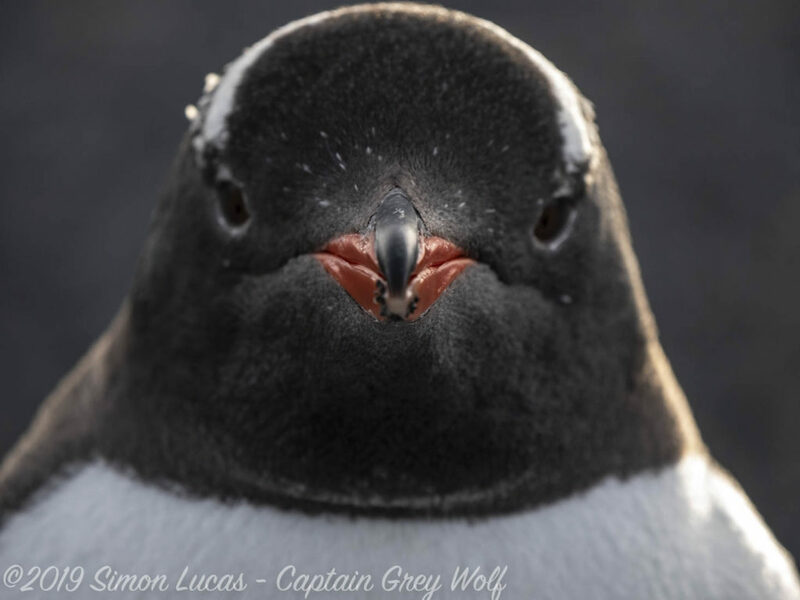 Then it was to shore to observe the Gentoo penguins and seals. 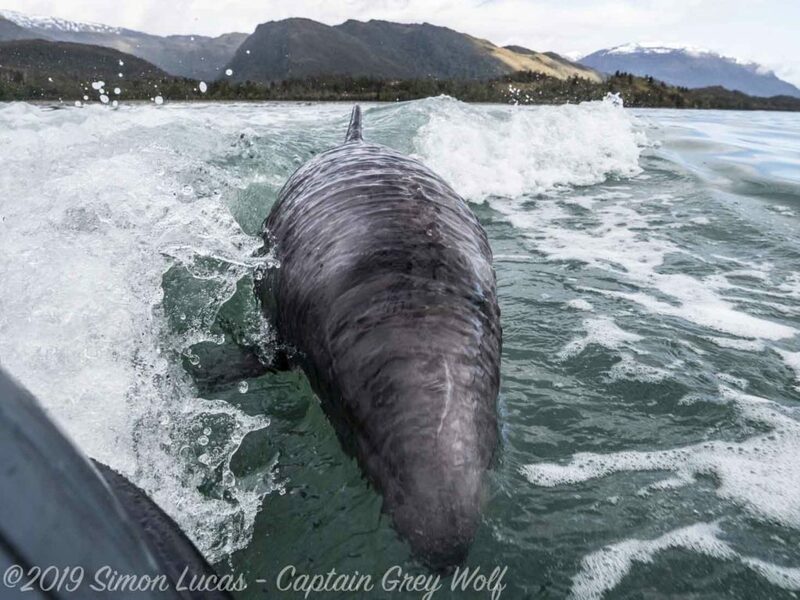 In the afternoon and evening, we watched humpbacks feeding in the Strait close up and did a tour of the glacier at the head of the bay. 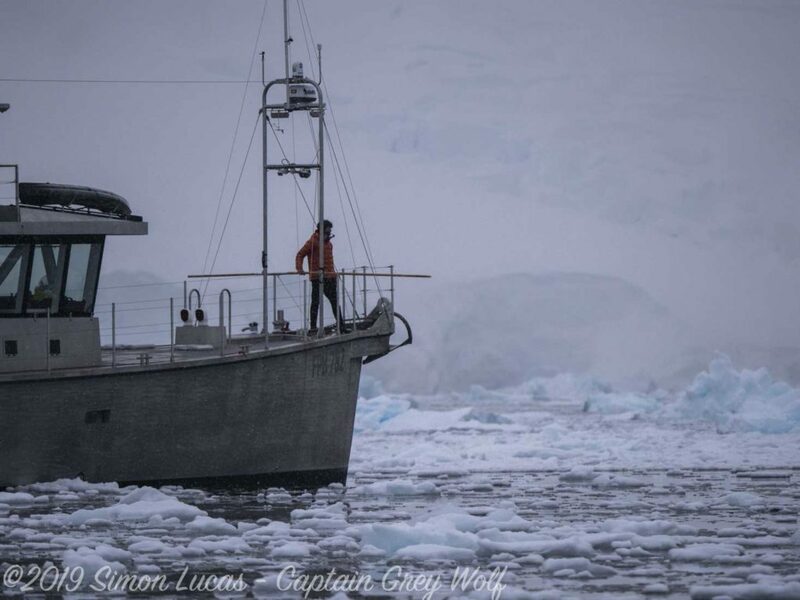 After dinner and a very long day, everyone went to bed early except those charged with anchor watch necessary due to the nearly constant flow of ice of from the glacier. Particularly necessary since the weather was forecast to deteriorate over night. We have ice poles aboard to push away the smaller chunks. During the day, we used our dink as a tug to push them away. 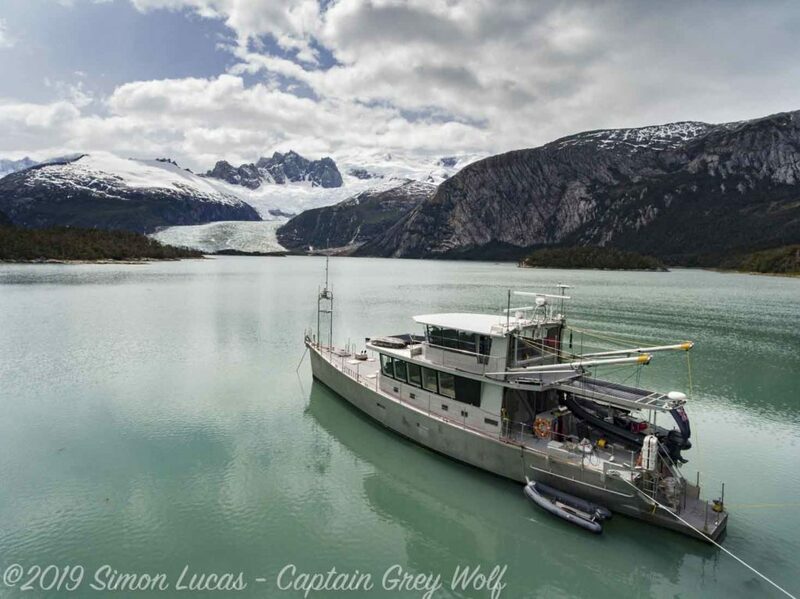 Overnight, Grey Wolf had to start her engines to maneuver out of the way of one the size of the boat. By 0530 today, it was blowing 35 with gusts to 50 knots in the harbor with snow and sleet and one meter waves. Glass is down to 974 mb. The surrounding hills are now snow covered. Can’t imagine what it is like outside the harbor. Looks like a day of anchor watch and boat chores. This entry was posted on Friday, January 18th, 2019 at 4:01 pm and is filed under FPB 78, The Logs. Both comments and pings are currently closed. 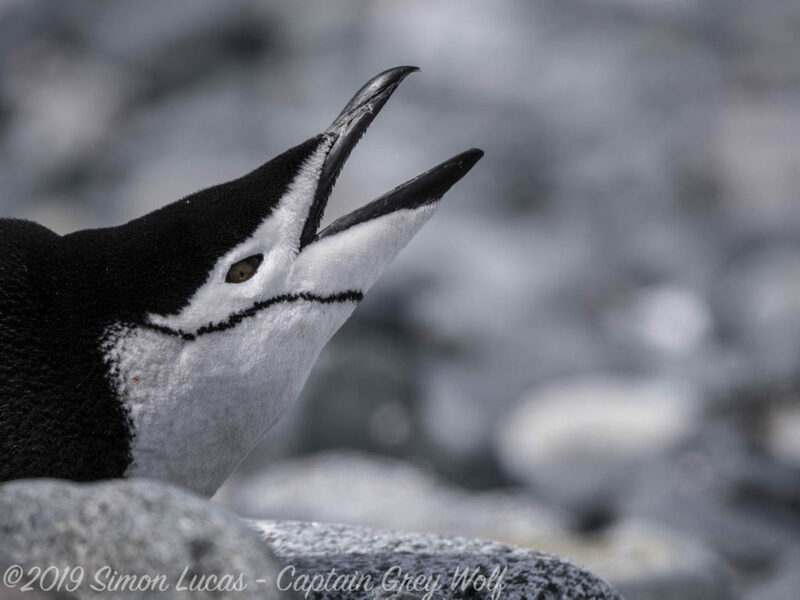 Your Chinstrap Penguin pic is a beauty. very envious, and would love to go back down on a much lower key voyage. What do you expect, if the Dashews are so ultra-conceited and close down production of their boats, because they believe that they are the only ones on the planet who can build ships? We would have loved to have found a way to allow the business to continue, and spent a considerable amount of effort towards that end. It was certainly in our financial interest to do so. But building yachts the way our clients expect is not an easy game. It requires constant vigilance and attention to detail. In the end, we did not feel it was appropriate to lend our name to a situation in which we were not comfortable. I apologize for my harsh words. You and your wife have developed and built some brilliant boats that combine luxury, safety, seaworthiness and efficiency in a magnificent manner. I would find it extremely sad and wasteful, if you were to take all that knowledge and experience to your grave eventually. Those boaters, who would like to own an FPB have no choice but to go to some copycat, hoping they end up with a vessel that will keep them alive when nature throws its worst at them. We understand your disappointment. We feel it too.